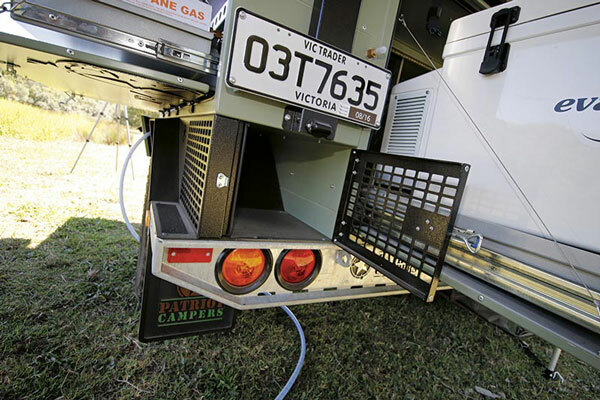 Patriot Campers sets a fine example to the Australian camper trailer industry. The original X1 hit the market with the force of a Patriot missile, leaving many opposition brands wanting. And with the new smaller and lighter X2, Patriot is set to do it again. The team’s standards are unquestionable; their marketing image unique; and their devotion to constant development is most admirable. When you meet the owners of Patriot, Justin and Sarah Montesalvo, you will understand their success. These talented two are young and strong, possessing an infectious drive that has helped them create and then take their award-winning range of products to the limit. I’ve had mates like Justin before – you know them when you meet them – they’re on a mission and God help anyone that gets in the way. The new X2 will retain all of the DNA of the highly successful X1 but with a lighter weight, bringing it firmly into the realm of the smaller offroaders such as the Nissan X-Trail, Toyota RAV4 or even a Jeep Patriot Sport. 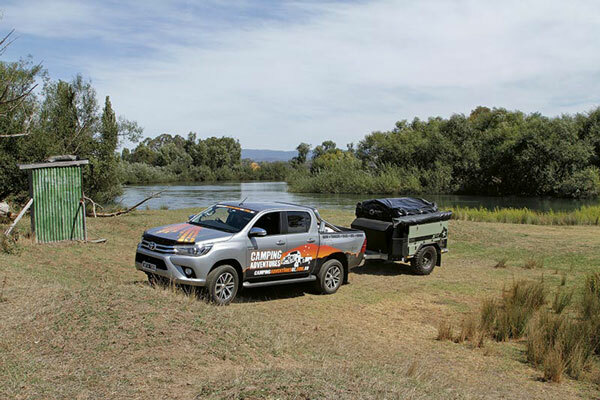 However, its very design, strength and towing weight will also appeal to the full offroaders who like a compact trailer in the rough and tumble. The brief also called for the new X2 to hit the market giving change from $30,000, allowing a boarder spectrum of customers to get into the Patriot brand without breaking the bank. Once the size and approximate weights were established, the first mission was to find a suitable independent suspension system. The search took Justin to Canada to find the Timbren axle-less independent suspension system that utilises Aeon single convoluted rubber springs. Rubberised suspension systems have been utilised in a great many industrial, commercial and recreational applications for many years. They’re strong and simple and work extremely well when properly matched to the towing weight. Rubber springs are said to be stronger than steel in many ways, and more reliable in a limited space. They provide a self-dampening variable spring rate and often require less ‘travel’ with increased load capacity. The Timbren steel construction seems immensely strong and very compact. They are extremely simple to fit with bolt on bracketing direct to the trailer chassis, and minimal moving parts. 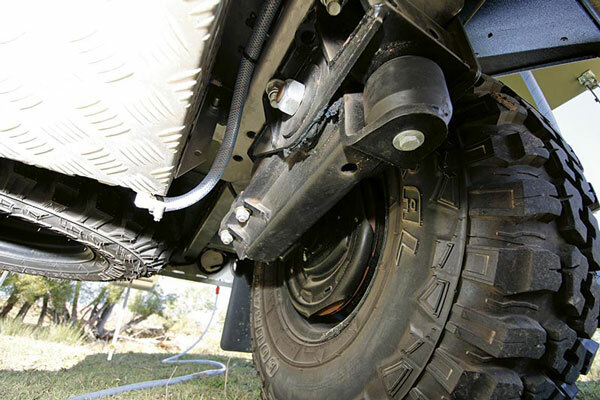 Essentially, they seem ideally suited to both on and offroad environments. On the open road, you barely know the X2 is behind you. 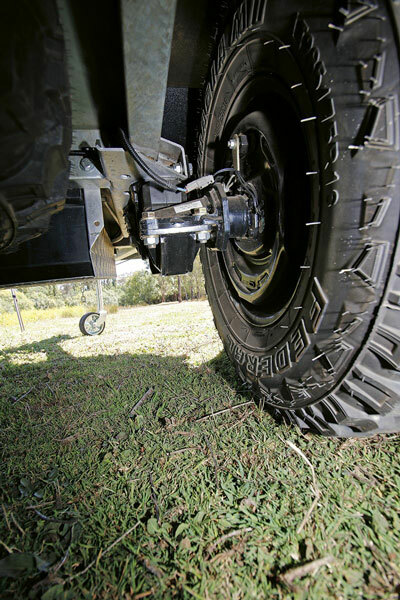 Even better, it will go virtually anywhere your 4WD will take you offroad. In fact, the trailer confidently cleared a very sharp ridge that had grounded the side steps of our HiLux. I would have the utmost confidence in recommending the Patriot X2 for the roughest offroad sojourn. Some of the early Patriot offerings came under criticism as they had swag storage or optional James Baroud rooftop tents. I still like the simplicity of such a configuration but the market called out for a larger softfloor tent on top and Justin replied with a very good custom-made Howling Moon option. 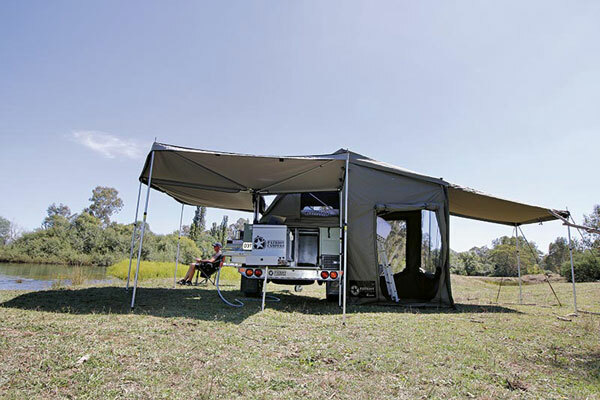 It is a good tent that provides excellent protection from the elements with tonnes of flyscreens, awnings and even a tropical roof as standard. 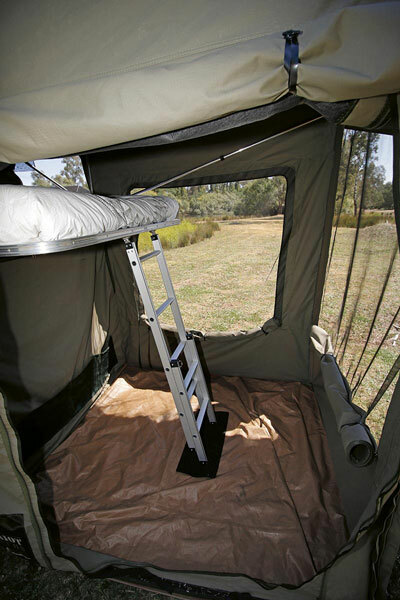 Inside is an elevated queen-size bed with a fold-out section and ladder access. 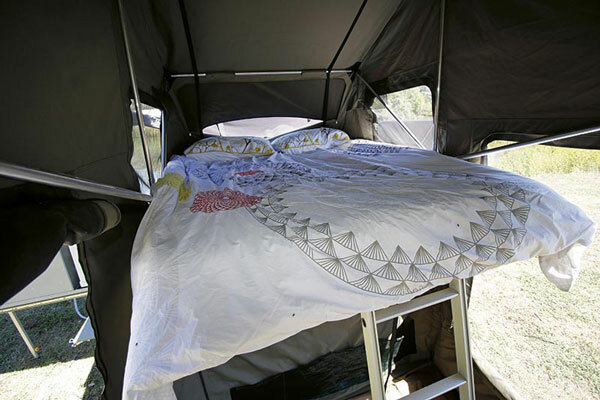 The floor space in the tent isn’t huge, but certainly big enough for protection in inclement weather and I reckon I would opt for the separate childs’ room that zips on to the large window awning, particularly if I was catering for a family. 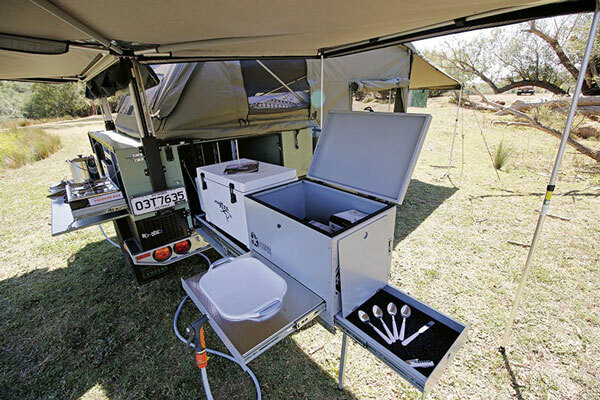 As we travel around to the rear of the unit and still under cover from the awning, we find a convenient pull-out tray that is long enough to support an optional 50-60L fridge ($1699 for the EvaKool 60L Fridge Dual Zone shown), a large pantry storage box, pull-out bench extension with utensils storage underneath, as well as a further pull-out mounting plate for a demountable plastic sink. 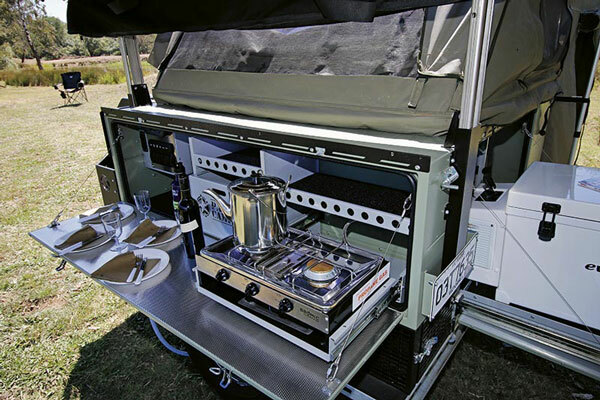 Hence, all of the cooking and catering equipment is conveniently fitted on one side and under the same awning. 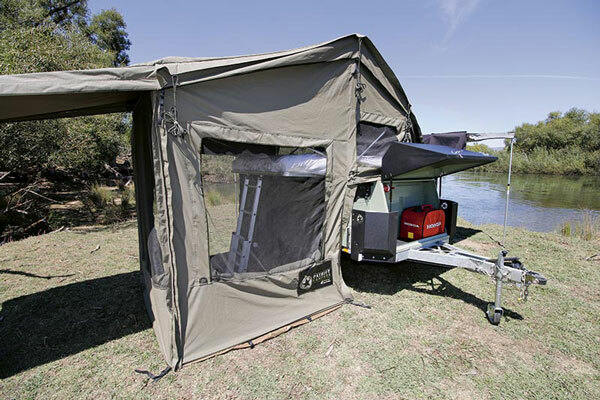 Next to the pull-out slide is a massive 480L cavity storage that is big enough for a small inflatable boat and its motor! This terrific fully dust sealed storage is ideal for tables, chairs and bulky items and, considering a total available trailer payload of around 500kg, it is capable of carrying some quite heavy items as well. The main body of the trailer is also pressurised to help keep that nasty red dust out. On the driver’s side we find yet another fully sealed full length storage cavity which is accessible with, or without the tent assembled. 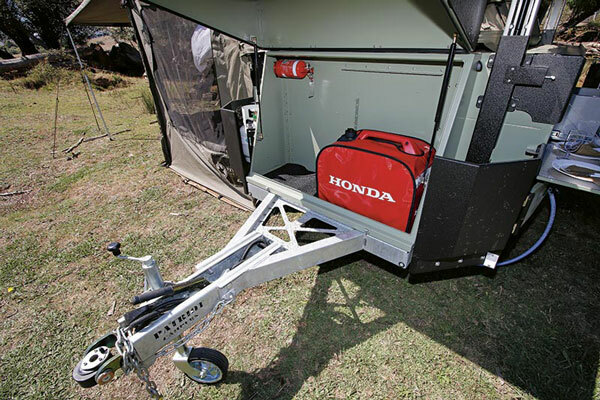 Overall there is a massive 1400L of storage offered by the X2 unit – simply amazing in such a compact trailer with so many features. 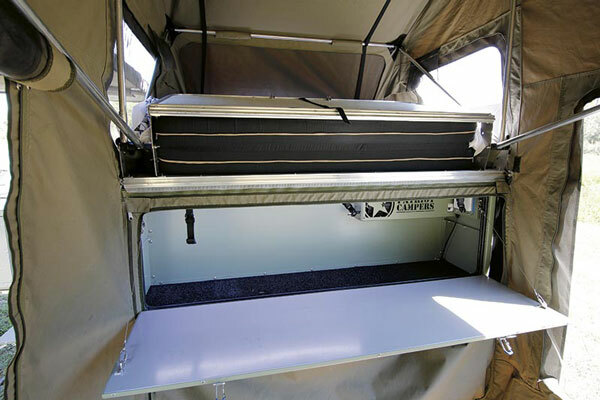 Under the shroud on the passenger side, a full length door drops downwards to reveal a stainless inner surface as kitchen bench space. 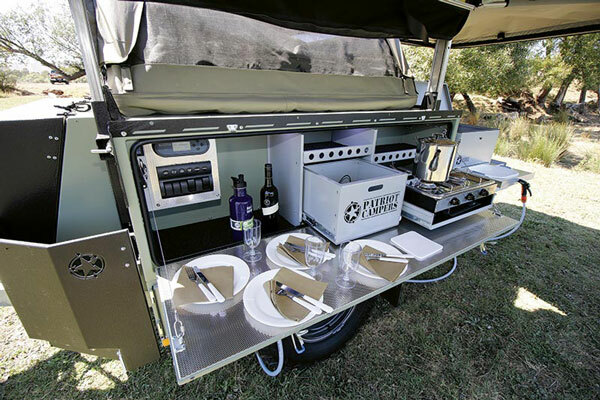 The full length cavity behind the door houses a Bromic stainless steel twin-burner stove with grill, a small pull-out pantry, considerable storage for pots, pans and utensils and a water and power supply module. On the upper side of the compartment is a Redarc 1215 battery management system for the single 120Ah AGM battery (a second one is optional), switch panel, 12V outlets and a water supply indicator. Under the pantry and surrounding the wheel arch is a lockable water filler and pressure pump with outlet to feed the hose and shower that is also used for water to the sink. To the rear on both sides is an open mesh container that is perfect for carrying damp items such as wetsuits. 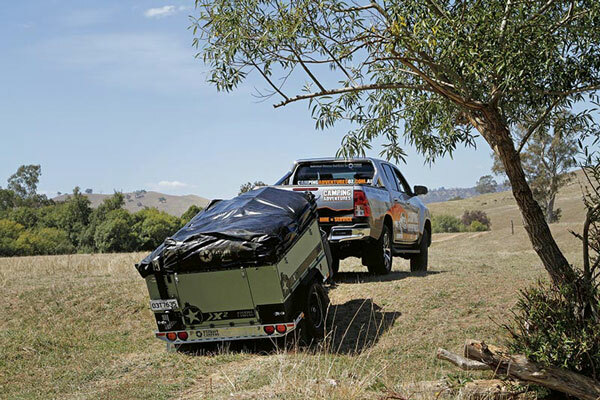 The X2 meets the brief for a value-packed, strong, expertly engineered, well finished and exceptionally tough offroad camper trailer. 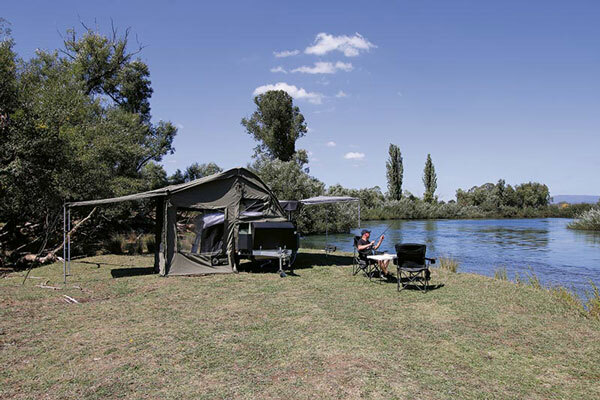 Its low purchase price and light weight brings the Patriot DNA into a completely new realm of the Australian market. 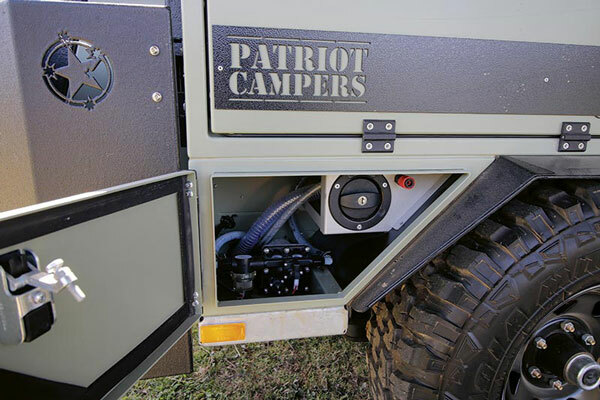 I’ll choose a Patriot X2 to stand side by side with me when the going gets rough, but I also look forward to enjoying its comforts and facilities as we travel the delights of this great land.